My first (but not last!) hello to Liquid Sky Lacquers! Ive spent the last month or so investigating polish brands i haven't previously heard of, or not tried. Liquid Sky Lacquers was one of them. 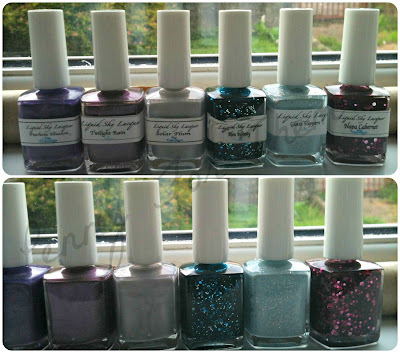 HOW i had never come across them, is beyond me, they're gorgeous polishes, a great variety of holos, thermals, glitters, all different colours and great prices! A good selection - and not all purple! Each polish has a different way of applying - but each one suits it! Like the Fuchsia Illusion is best put on in medium coats as if you do it too thin it will dry too quick and catch - too thick and it'll run down your fingers! The two Jelly polishes - "Bleu Infinity" and "Napa Cabernet", are actually pretty flexible. If you're looking to add thin quick coats, it seemed to work, but i used 3 medium coats to build them up slowly and chance to dry a bit between each coat. The "Glass Slippers" is a very thick crelly polish. A beautiful pastel shade of blue, this is best with the thicker side of medium coats due to its already thickness and this will then only require 2 coats. Fuchsia Illusion is a beautiful thermal polish that starts off a gorgeous holo purple, and when on your nails heats up to a really nice pink and leaves the tips purple - i love this! Its got the thermal aspect which makes it look very cool, it has a great combination of colours and theres holo particles to boot - what else would you want from a polish! I have to admit this is my favourite of the bunch! and after mere seconds, it changes to this! Think you can see why its my favourite! Next up was "Twilight Rain" - a dusky purple holo. 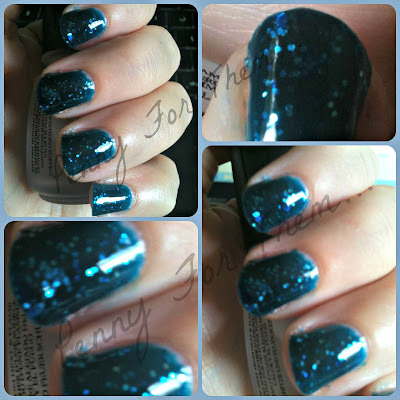 Bleu Infinity is a deep blue teal jelly polish with just the right amount of glitter showing on it, that looks great layered. Glass Slippers is a bright sky blue thick polish with minute pieces of holo glitter that sparkle just slightly when catching the light, making it almost a fairytale like polish! And another jelly polish - in a deep red wine yummy colour. 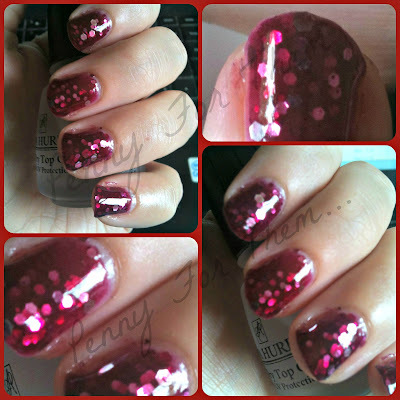 Hexagons of glitter layer nicely giving this polish alot of depth and it looks delicious! Lastly is "solar plum". I had to wait for a day with sunshine for this one as it states it changes colour in the sun! (which we haven't had a lot of here in the UK!). So it peeped out today and i gave it a whirl. To apply it indoors, its a creamy colour with a hint of holo glitter. I waited with my hand in the sun for 15 minutes! But there was quite a breeze and I'm not sure if it needed more heat rather than the sun, but either way, i wasn't getting alot of it, but i loved the light purple holo it turned into - it was really pretty and sparkly! So that's my first Liquid Sky lacquer haul, and i really don't think it will be my last. Aren't they gorgeous!! Any Liquid sky's you'd recommend to try?